How to Get the Most Out of Your Porcelain Veneers in Randolph! You deserve to have the smile of your dreams and now it’s time to make it happen with porcelain veneers in Randolph. But you want to make sure that before you make this commitment, you have a strategy in place to get the most out of your fixtures. It’s important to ensure that you have a beautiful smile for years to come. Thankfully, your local cosmetic dentist is weighing in with some tips to help you accomplish your goal. How Does the Porcelain Veneer Procedure Work? In order to establish effective ways of preserving your new veneers, it’s best to have an understanding of how they’re crafted and placed in position. These thin shells are made of high-grade ceramic and are custom crafted to fit the color of your teeth, their shape and the contour of your natural smile. 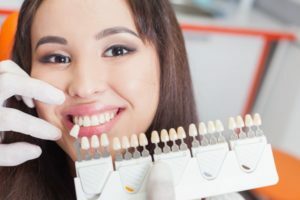 Your dentist will first remove a thin layer of enamel from your teeth and then capture images of them along with a bite impression that will be sent off to a trusted lab to fabricate your permanent veneers. In the meantime, you’ll be fitted with a temporary set to wear. After your permanent veneers are ready, you’ll return to your dentist’s office to have them affixed to your teeth. And just like that, your crooked, slightly misaligned, gapped or crowded teeth will be made over into a perfect smile! Once you get your brand-new look, you want to keep it, so you may wonder whether your veneers are susceptible to staining. The reality is that veneers are very resistant to staining. Your other teeth aren’t, though, so you should consider having them whitened before receiving your new applications. Therefore, you’ll run less of a risk of having a contrast in the appearance of your ivories down the road. Limit your consumption of foods and beverages that contain tannin, a natural staining agent. It can be found in such items as tomato sauce, berries, tea and coffee. Avoid tobacco usage. Not only is it harmful to your health, but the powerful toxins released can contribute to severe staining of your teeth. Although your veneers aren’t subject to staining, they can still be damaged. Using your teeth as tools can lead to chipping or dislodging your veneers. Eating ice or hard foods like certain nuts and popcorn kernels can damage them as well. If you suffer from teeth grinding (bruxism), you run the risk of damaging the beautiful smile that your veneers have created. You can talk to your dentist about possible treatments. Once you get your porcelain veneers and look into the mirror at the new person staring back at you, your confidence will shoot through the roof! Now you know how to preserve that image. But the process begins with you reaching out to your cosmetic dentist in Randolph to schedule a consultation, so don’t hesitate! Dr. Glen Goldstein earned his DMD degree from the University of Medicine and Dentistry of New Jersey and has gone on to deliver top-notch care to the Randolph community for nearly 30 years. Still, he seeks to improve his skills and broaden his knowledge by participating in continuing education programs. An expert in cosmetic dentistry, Dr. Goldstein practices at Randolph Dental Care and can be reached for more information through his website. Comments Off on How to Get the Most Out of Your Porcelain Veneers in Randolph!